Like most people stress can get the best of me. Project after project, priority after priority: it can eventually become too much. I started to look for ways to tend to my depleted emotional wellbeing and put an end to the monotonous cycle of stress I had become caught up in; but what should I choose? Yoga just confused me and meditating made me sleepy. I thought I was at a loss until I discovered a local women’s singing group. While it may be a pastime usually relegated to the stage or the shower, depending on the singer, singing is proven to be incredibly beneficial to your mental and physical well being. The Sidney De Haan Research Centre for Arts and Health recommends singing as a way of promoting mental wellbeing and researchers at the University of Gothenburg in Sweden have discovered that choir members’ heartbeats synchronise when they sing together. This brings on a calming effect similar to yoga. As soon as I walked into class the difference between the rushed, noisy world of central London, where no one dares crack a smile or show any sign of weakness, and the class was immediately apparent. Instead of the usual averted gaze and complete lack of acknowledgement I was used to when going to events or meetups in London, I was greeted with smiling faces and welcomed like an old friend. Whilst the benefits of singing are undeniable there is also something to be said about being in a creative space with a group of women. Although Shilpa has led mixed gender groups previously she felt there was a need for women to come together in this form. Although group singing also has a strong connection to politics and protest movements Shilpa is quick to point out that protest songs are not the only link between singing and politics: “Whatever we choose to sing, for me the radical change potential is in the personal growth and development that happens as a result of the creativity and inclusive connection with others. In Sisters of the Yam bell hooks declared that “choosing wellness is an act of political resistance”. As activists we can overburden ourselves with too many projects, which on top of work, relationships and daily life can mean that we are unable to fully sustain all of our projects. To remain committed to activist work and to our own wellbeing we owe ourselves that day off, that massage, that chance to fully feel the strength of our lungs intertwine with the strength of twenty other women. Whatever way you choose to de-stress, I’ll be singing my heart out. 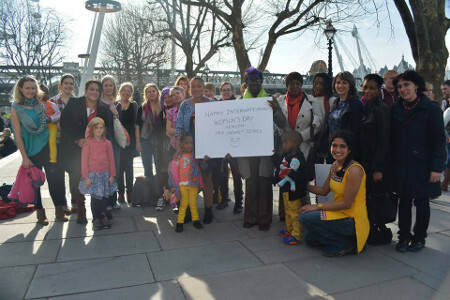 The image shows a group of women with some children standing outside, holding a sign that reads “Happy International Women’s Day from My Heart Sings”; it belongs to My Heart Sings and is used with permission.